A full Scottish breakfast is similar in many ways to a full English breakfast. This page examines the essential differences between the two and provides full cooking instructions. A full Scottish fried breakfast is not dissimilar to a full English fried breakfast. 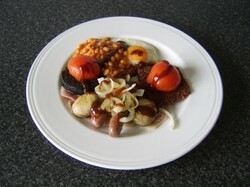 It consists of bacon, sausage and egg, as well as perhaps fried mushrooms, onion and tomato, with baked beans in tomato sauce. There are a few differences, however, between the Scottish and English fried breakfasts which make each quite distinct. These include the fact that sausage served with a full Scottish fried breakfast is likely to be a Lorne sausage (even though links may be served as well), while the fried bread is likely to be replaced by a tattie scone. This page looks at some of the more popular ingredients included in a full Scottish breakfast and how to cook them to best effect, with the quantities listed being per person. A Lorne sausage is essentially where sausage meat has been compressed in to large blocks, rather than squeezed in to skins, to be subsequently sliced to a thickness of around half an inch. One Lorne sausage is included in the breakfast, as well as in this instance two pork links. A slice of black pudding is essential, as well as two rashers of bacon. Note the difference between British bacon compared to American bacon - British bacon is taken from the back of the pig, as opposed to the belly. Two smallish closed cup mushrooms, one small to medium tomato and half a small white onion will be fried with the meat components of the full Scottish breakfast. A tattie (potato) scone is almost a type of bread, made in Scotland from mashed potatoes, flour and salt. One small egg and a couple of tablespoons of baked beans in tomato sauce complete the breakfast ingredients. All too many people prick link sausages with a fork prior to starting them cooking. This is designed to prevent the skins from bursting. Unfortunately, all that is actually achieved is that the juices of the sausages are lost to the pan, affecting the texture and flavour of the cooked sausages. Instead, simply cook them slowly on a very low heat. This prevents them bursting and retains the juices in the sausages. 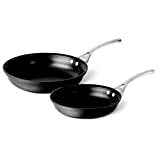 Add some vegetable oil to a large, non-stick frying pan. Put in the link sausages only and fry on a very low heat for ten minutes. After this time, turn the sausages and add the Lorne sausage and black pudding slice to the pan. Cook for a further five minutes and turn the Lorne sausage and black pudding for a final five minutes of cooking. Remove the items to a preheated plate and cover with foil to keep them warm. Do you have the necessary tools for the job? As soon as the meat is out of the pan and while it is still hot, add the halved tomato, flesh side down. Remove the stalks from the mushrooms and put them in the pan, cup side up, turning half way through cooking. Finely slice the onion and separate the strands before adding. Fry on a fairly high heat. After five minutes, add the tattie scone to fry along with the remainder of the ingredients for one minute on each side. It is always advisable when cooking with eggs to allow them firstly to reach room temperature and that they not be used straight from the refrigerator. If you are preparing a fried breakfast, therefore, take your eggs out of the refrigerator the night before. It is also an excellent idea to break the egg firstly in to a small bowl or cup, rather than straight in to the frying pan. This makes it much easier to pour in for better presentation and means that if any rogue pieces of shell get in to the egg, they can more easily be removed. Add a very little oil to a smaller frying pan and wipe it around with kitchen paper. You want a thin coating only. Bring the pan up to a fairly high heat and pour the egg gently in to the centre. When the egg starts to solidify around the edges, reduce the heat and leave it alone to cook for three to four minutes. It can be turned and fried for another minute or so after that time to firm up the yolk if desired, or simply served. When your egg is in the pan, firstly add the baked beans to a small saucepan. Put the pan on to a medium setting and heat the beans through, stirring occasionally with a wooden spoon. The bacon is then placed on a rack and tray under an overhead grill to cook for two to three minutes each side, depending upon preference. Hopefully, following these instructions will see all of the components of your fried Scottish breakfast ready to serve at the same time. Begin by laying the bacon on your plate, topped by the sausages and black pudding. You will notice that the plastic rind has not previously been removed from the black pudding. This is simply to minimise the risk of it crumbling during cooking. It can be carefully cut and removed at this stage. Lay the tattie scone on the plate and top with the egg, before adding the tomato, mushrooms and onion. Spoon on the beans last of all and serve immediately. Have You Ever Enjoyed a Full Scottish Fried Breakfast? Thank you, samuraiblogger, for visiting and commenting. Wow! As if I wasn't hungry enough, LOL. I guess I know what I'm gonna be eating tonight for my "Breakfast for Dinner"! I hope this is something you may try for yourself. What a mouthwatering wizzle, it makes me very hungry. Wow! Thank you very much chefkeem - it's good to be here and I hope to publish a lot more pages in the very near future. :) Hope you have now enjoyed a good meal! Disclaimer: My enthusiasm has nothing to do with the fact that I was starving while reading your article. :) Good to have you with us! Chestnut Cake with Chocolate Whipped Cream Frosting is a comfort food recipe which deliciously celebrates the autumnal harvest of chestnuts in the Czech Republic.